Blaine and Felicia's Family Blog: Can You Solve Our Christmas Puzzle for 2009? A place for photos, video, posts, etc. on what our family is doing. Can You Solve Our Christmas Puzzle for 2009? All the kids had a lot of fun creating our annual Christmas Puzzle for 2009. It's a standard word search puzzle, so it shouldn't be too difficult, but there is a hidden message to find when you are done. If you are absolutely stuck, you can find the answer here. When you solve it, please don't give away the answer but feel free to add a comment to let us know that you successfully figured it out. 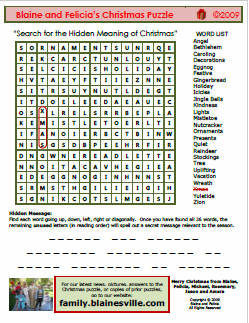 And we are always looking for new ideas for next year's Christmas puzzle, so submit those too. Copyright © 1998-2019 Blaine and Felicia, All rights reserved.